There are two known UL710 schematics at the moment. The official JMI schematic OS/112 issue 2 dated at 4 – 10 – 66 and the other called ‘Un-numbered’. 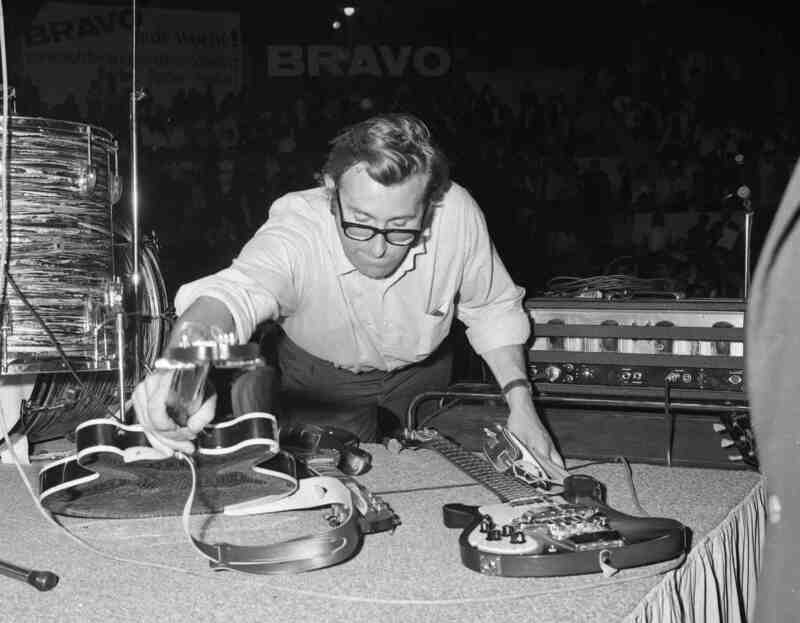 Jim Elyea published the OS/112 in his ’Vox bible’. It indicates a couple of changes to the original first issue that was released at 11 – 3 – 66. Unfortunately, there are still number of errors in the schematic and maybe for that reason someone started to re-draw the schematic taking the actual amp circuit as reference. The un-numbered version also has errors, and it seems that it is just a draft which wasn’t ever finalised. 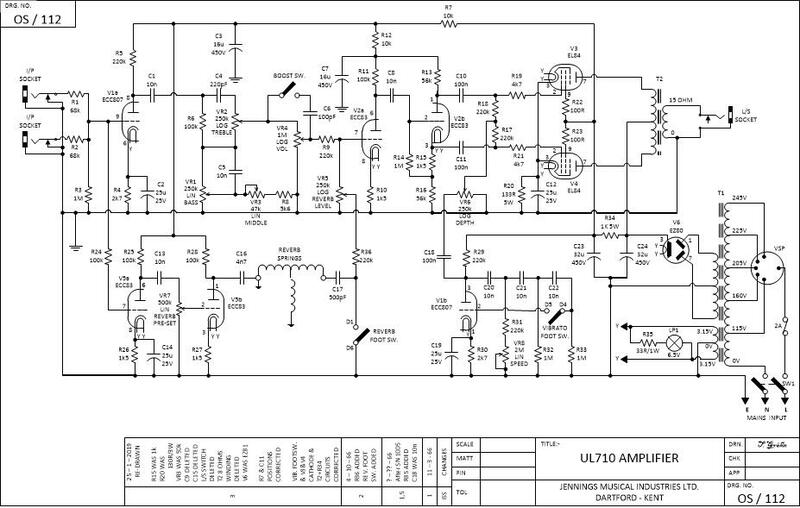 This schematic is following the actual built amps more precise though. These two schematics have different component numbering. In OS/112 the numbering is based on the drawing itself, starting from upper left corner towards the lower right corner. The numbering in the other schematic follows more the positioning of the components in the tag board and placing of the tubes in chassis. I am referring to the numbering of OS/112 in this article. Since the both schematics have mistakes, I decided to reverse engineer the mystery and re-draw the OS/112 schematic based on my own amp SN 1005. While doing that I noticed some additional changes that hasn’t been documented in issue 2. 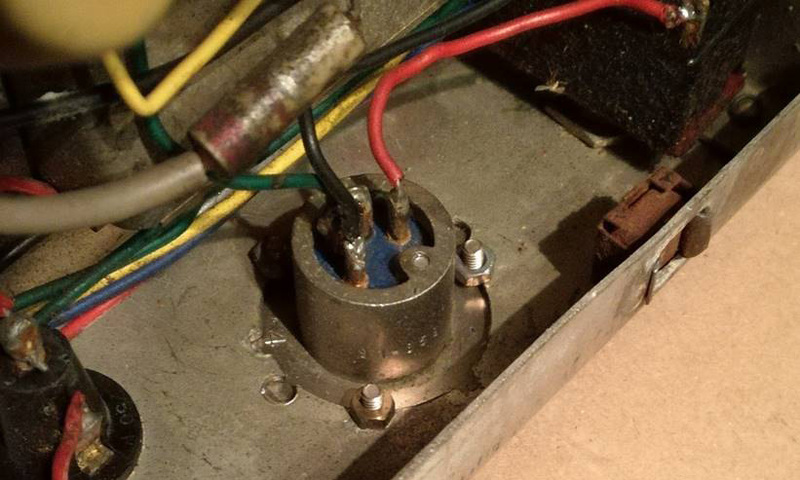 The Issue 2 states two changes: addition of R36 and Reverb footswitch. 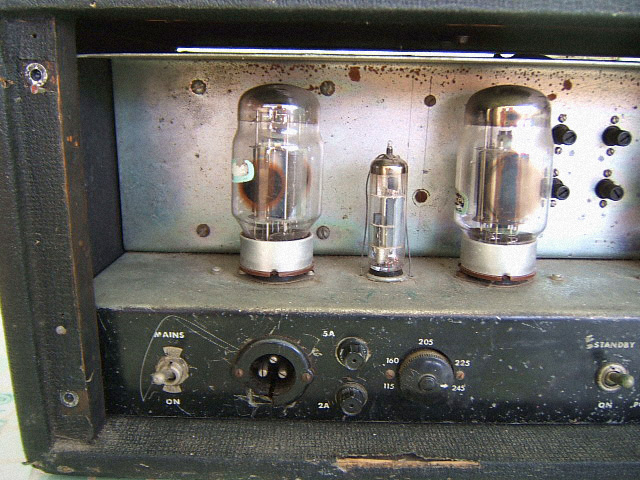 My amp SN 1005 is one of the first ever made, if serial numbering started from 1000 or 1001. It represents the circuit that should have been documented in the first version. It has two other differences than those mentioned in Issue 2: Also R35 is missing and value of capacitor C18 is 10nF. In later amps C18 was changed to 100nF and they all have those two additional resistors R35 and R36 as shown in Issue 2 schematic. All amps have had a two-button footswitch which controls reverb and vibrato. 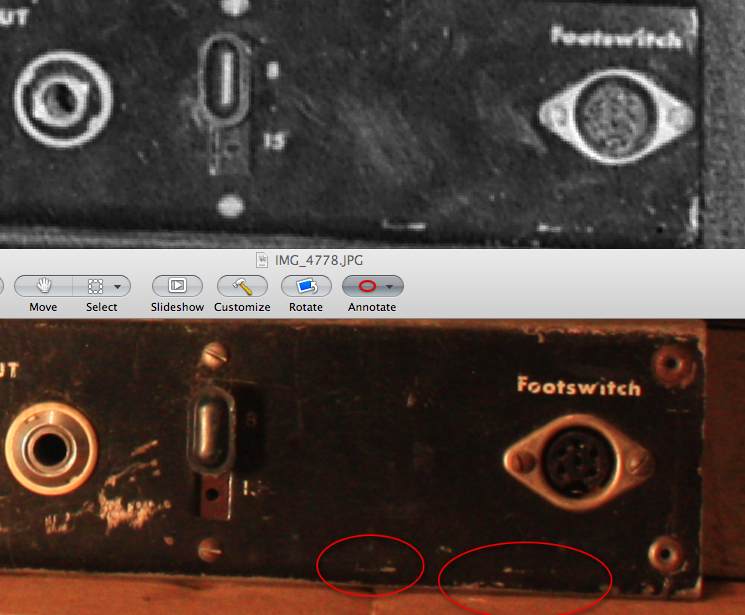 It means that the missing footswitch was just a drawing error. I marked the R35 and C18 related changes as ’issue 1,5’. As mentioned earlier there are errors in the OS/112 Issue 2 schematic. Quite many errors are related to A+ voltage circuit. All amps seem to have EZ80 rectifier tube, so I changed that. Next in line is the point where the A+ voltage is taken to the center of the output transformer’s primary winding. It is taken directly from the EZ80, not after R34. Also position of R10 was incorrect, now it is in position as in the actual circuit. 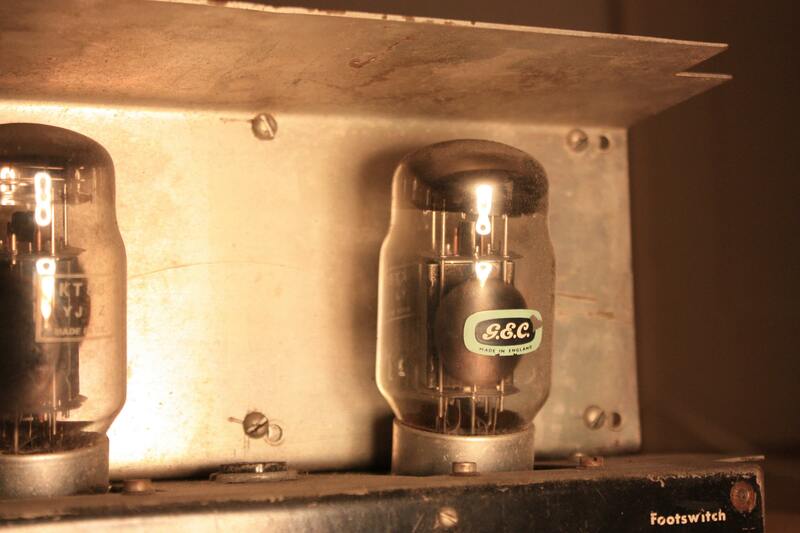 It feeds A+ voltage to all preamp ECC triodes, except V1b which gets A+ voltage through R29. I deleted two cathode capacitors C9 and C15 since they are not installed to any of the amps. 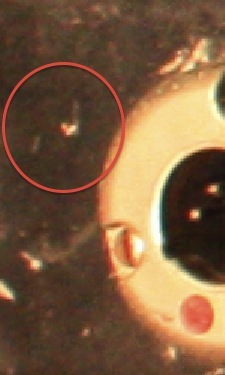 Position of coupling capacitor C11 was also drawn incorrectly. It is connected directly to V2b cathode, not to the other end of R15. Value of R15 is also changed to the one in amps (1k5). Another mistake was in V3 and V4 cathodes which were not connected to each other as they should. I also changed the value of the cathode resistor R20 to the one in amps (133R / 5W). Also, the vibrato oscillator circuit is now fixed. 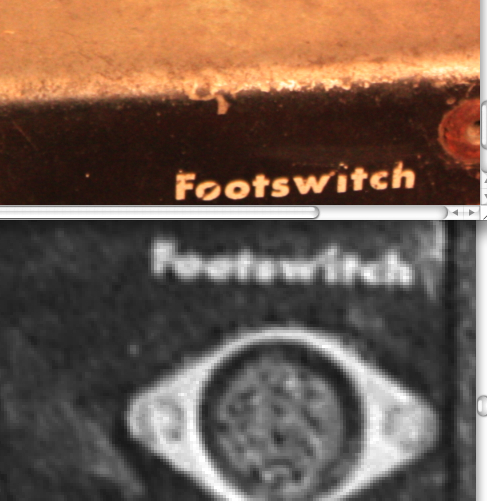 The change is related to the position of the footswitch. If you do not own the footswitch, then your vibrato isn’t working, since you need it for shortcutting the oscillator circuit. The last changes are the loudspeaker switch and 8 ohms winding in T2 that I deleted, because UL710 has only 15 ohms output and switch is missing. I have listed all corrections that I made to re-drawn ‘issue 3’. 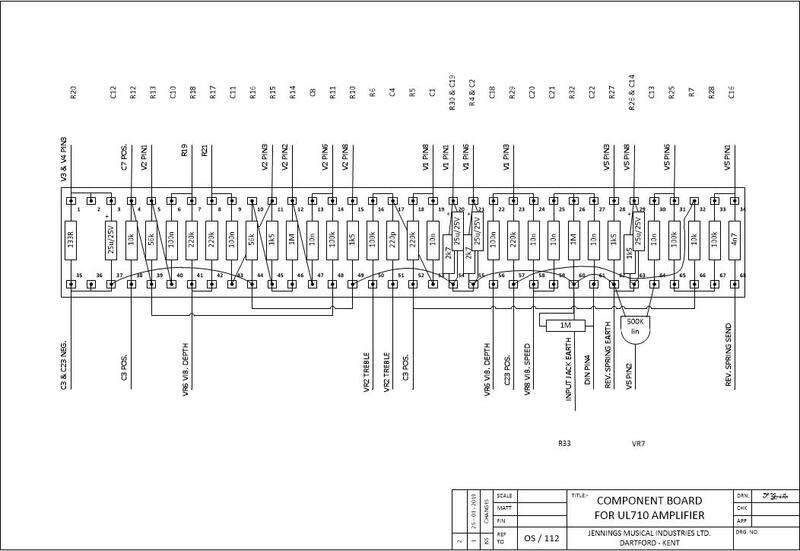 I have also drawn another picture that shows the components in the main tag board. 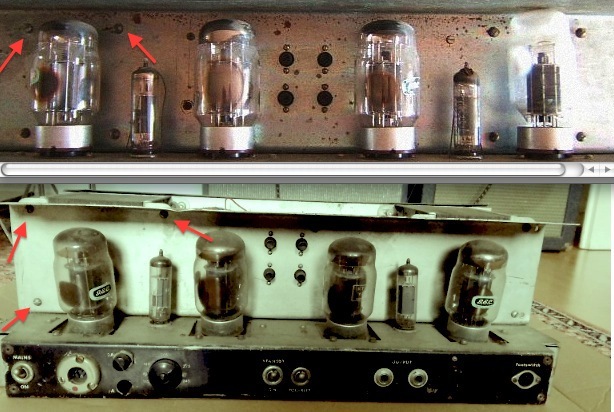 I hope that these two pictures give you some help with your amps. I have tried to check everything for avoiding to creat any new errors, but I cannot be 100% sure if everything is correct. NOTE: I DON’T TAKE ANY RESPONSIBILITY OF THE USAGE OF THE PICTURES, THEY ARE DRAWN ONLY FOR INFORMATION PURPOSES AND THEY CAN STILL HAVE ERRORS. WORKING WITH AMP WHEN CHASSIS IS TAKEN OUT FROM THE CABINET IS DANGEROUS DUE TO HIGH VOLTAGES. LET YOUR ENGINEER DO THE WORK! A fabulous early chassis has been found, in Switzerland of all places, which raises all sorts of questions. 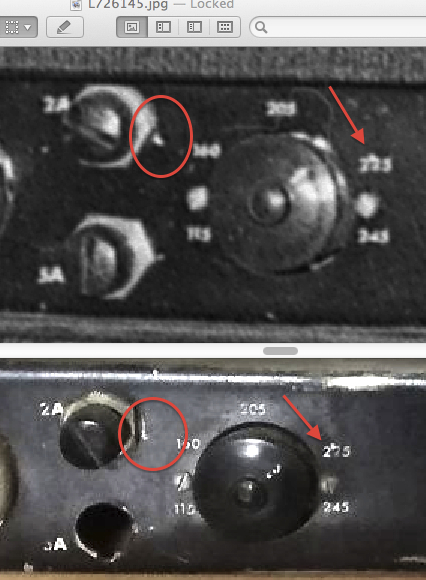 We’ve been trying for years to find out more about the Beatles amps, but it was impossible to get any information on the rumoured survivor. 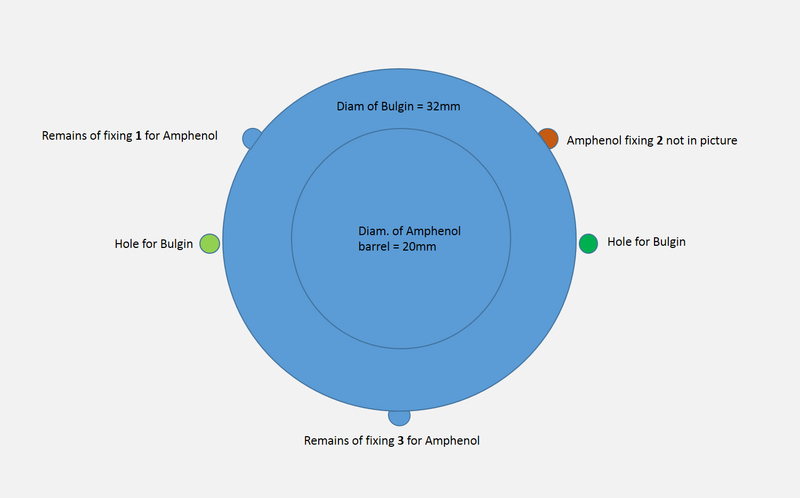 This example now gives us a real insight into those amps. Was this the style that the Beatles amps used? Could it even be an actual Beatles amp? We know guitars and gear were lent out and ‘went missing’ from various places. 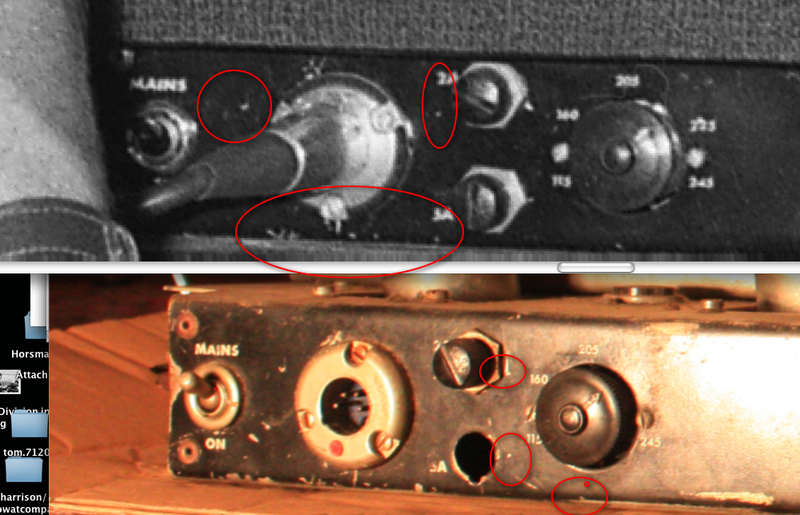 Without any provenance though (this amp was just found in a basement), or any pics of the known surviving beatles amp, all we could do was to examine it as closely as we could, and see where it would take us. The first thing that leapt out was the odd cut-out corners on the back; we hadn’t seen anything like this before. 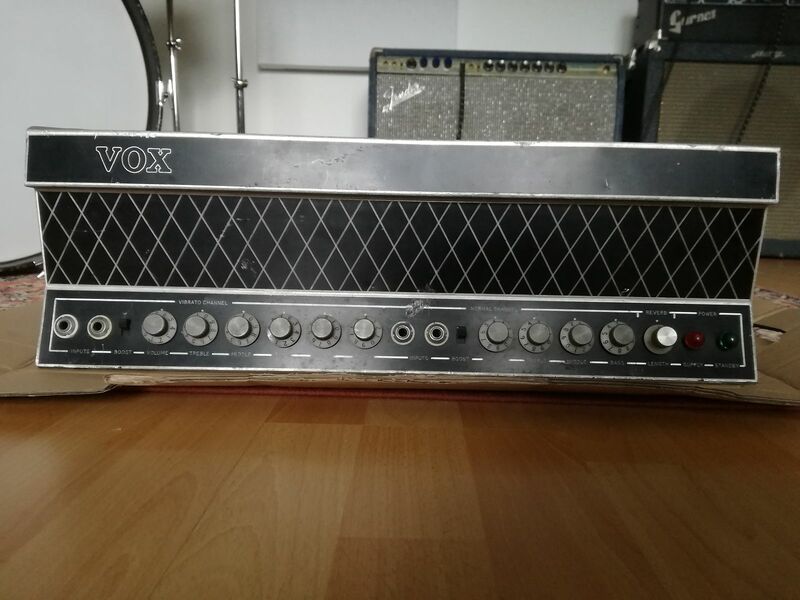 This didn’t necessarily mean it wasn’t a legit triumph/vox produced amp – but unlike other features, this seemed to be a one-off. These must have been awkward and time-consuming to produce; what was the point of all the time and effort? 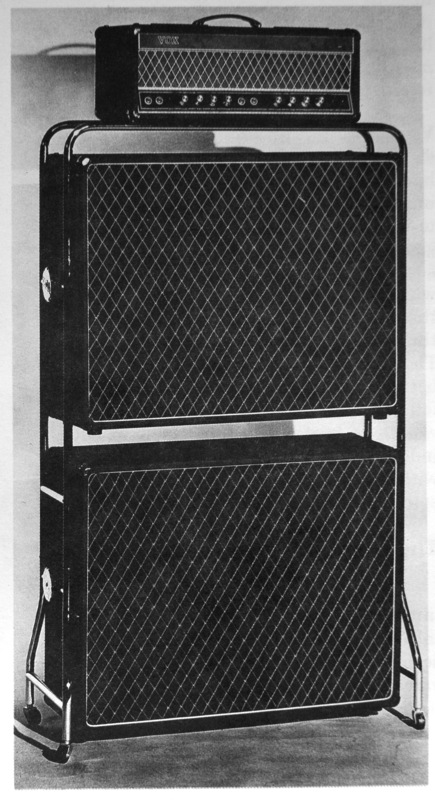 The Beatles amps had a removable back panel. 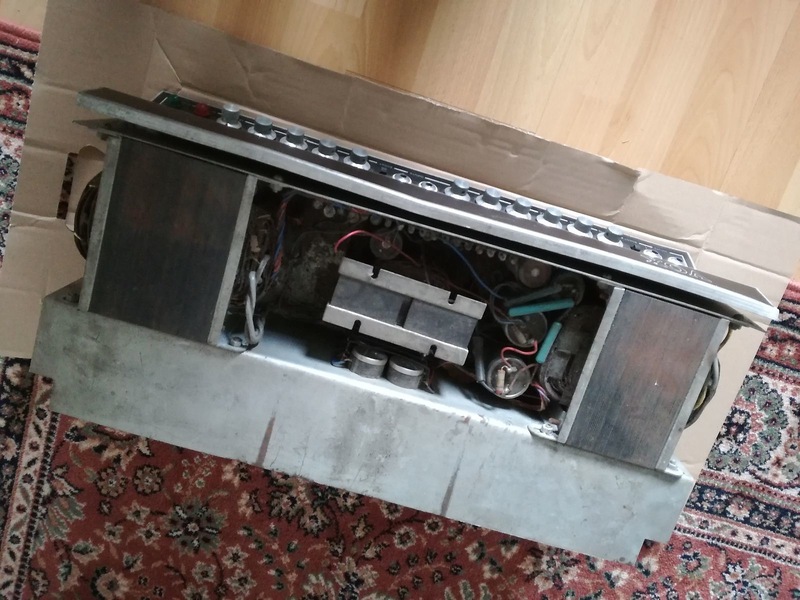 Back in the VoxTalks days, it was presumed that this was so the chassis could be removed from the back for servicing..but the tops of screws were visible holding the panel on. These obviously went into some kind of support – but these support struts at the back would have blocked the removal of the chassis. The chassis could never have been removed from the back then. 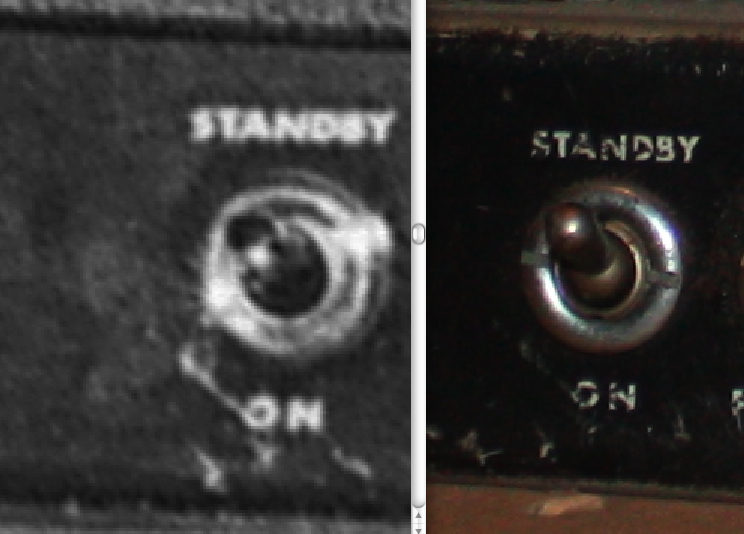 It seems the removable back panel was to make it easier to swap valves, and change the bias. This nice idea was dropped in production though; the single handle was swapped for two, to make it safer and easier to carry, and the whole thing was made wider and taller. Probably this was for ventilation; they were already heavy units, with their big transformers. The transformers on this Swiss one were even bigger; with little ventilation in the cramped space (the prototypes were smaller, roughly 730-sized), they must have got very hot inside & on top. It was great to finally see the slanting valve bases in detail; until now we’d only seen limited views of them, obscured by the rear panel. 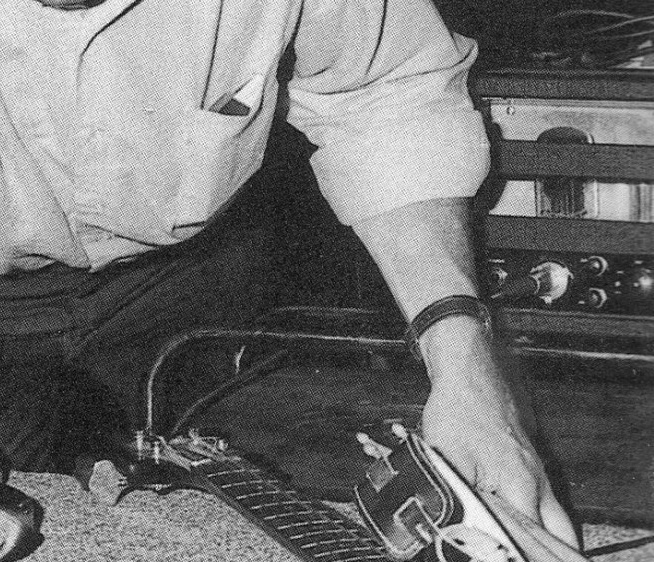 It was presumed before that the slanting bases were to help ventilate the amp; but now, with these ones at least, we can see that the slanting bases seem to be enclosed, so….little help with the ventilation there. 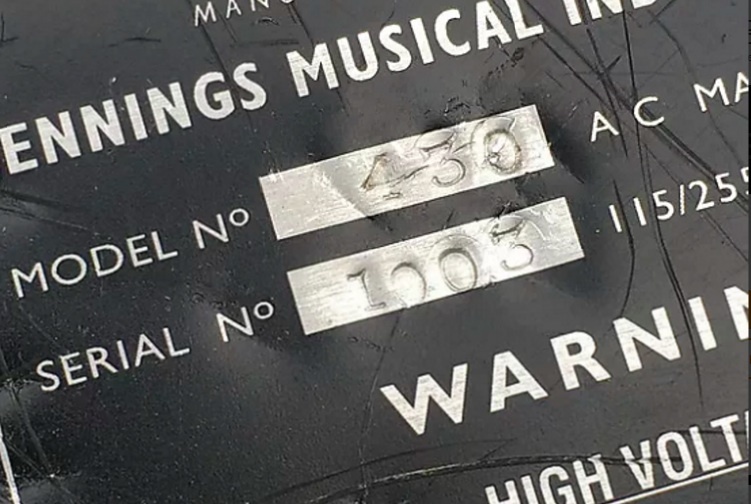 Again, it seems to have been to help with replacement of the tall kt88 valves – the Beatles units were less tall than the production run; they seem to have designed these to allow just enough space to swap out the big kt88s. One of the most remarkable things though is those transformers; they are (even) bigger than normal. They are the same height, but much deeper, with shorter ends. This must have made them even heavier. Mal was a powerful guy, but seems to have remarked on the weight of them to the driver, Alf Bicknell. 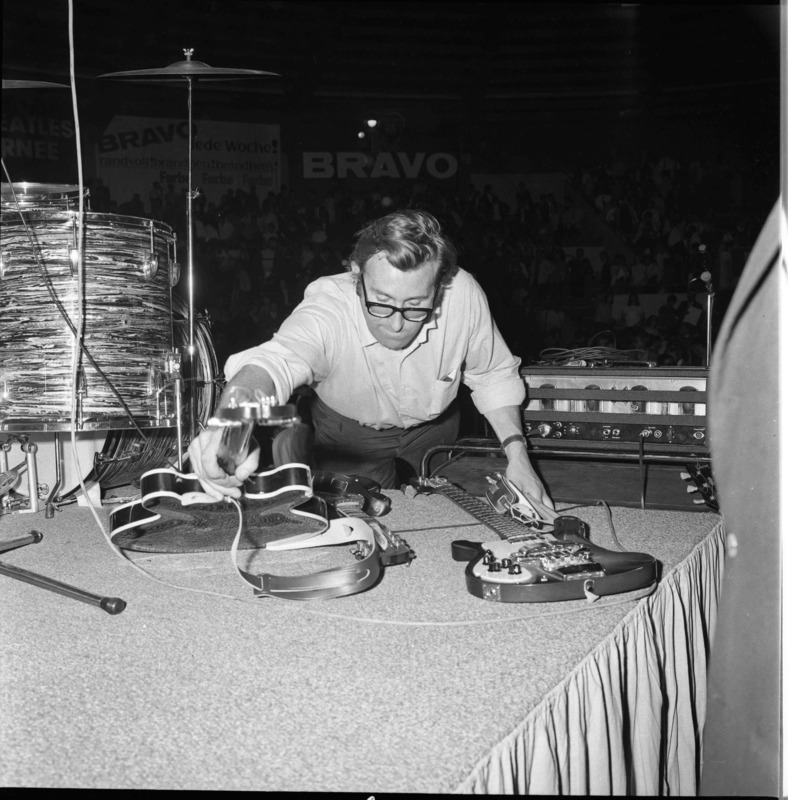 (see – it-was-almost-50-years-ago-today-moving-the-beatles ) If the Beatles amps had transformers like these, it’s no wonder he complained – he can’t have been looking forward to having to carry these on the planned tours. The cut-out corners (the overhanging metal cover over the valves has also been cut away) seemed to have been cut to fit around the support struts for holding the rear panel on the back. 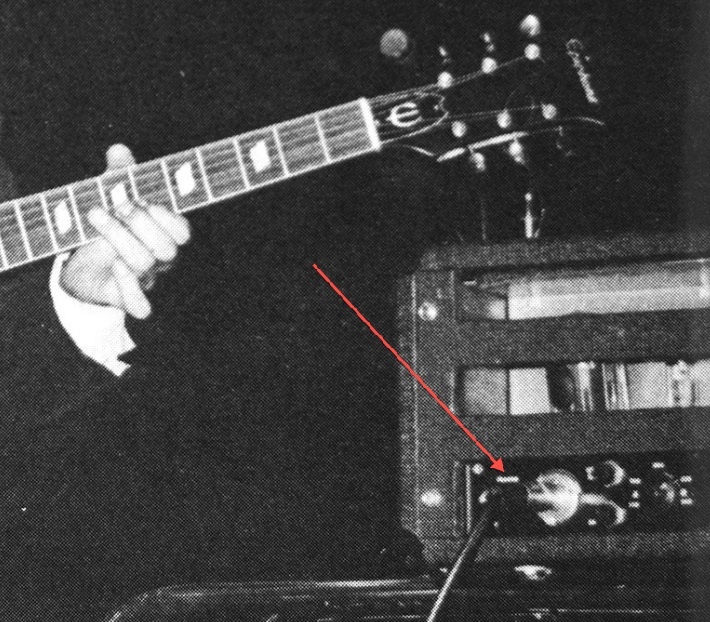 There’s a problem though; there are only a handful of clear photos of the amps, especially the back – but one photo with Lennon at Abbey Road does show the lower corner of the rear panel. The ‘problem’ is that the chassis doesn’t fit around the strut; it seems to just reach it, and then stop. Making and riveting cut-outs like these would seem then to have been a complete waste of time and effort, if the Beatles amps had been the same. It’s hard to tell what was behind the corner though… with a bunch of mostly very old photos of the backs of the Beatles amps enclosed in their boxes, it would be very hard to prove if there were any redundant cut-outs in the corner behind. The same was true of the transformers; there are no photos of just the inner/under chassis. 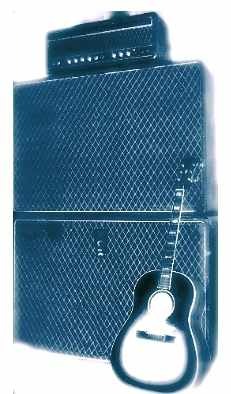 If there were these redundant cut-outs on the Beatles amps, the lower strut of the rear panel blocks the view of them. Back of an early box, with the rear panel removed. This box is larger & longer of course, so the MAINS switch is easier to get at here (the one in the Lennon pic is right by the edge), and this chassis doesn’t have slanting valves, or cut-out corners. 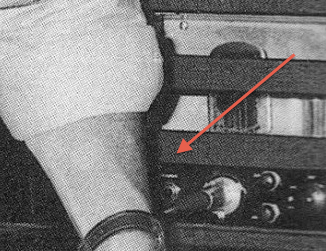 The cut-out in the new Swiss amp seem to suggest that the rear panel was originally planned to have been flush with the back. You can see from the Lennon pic that the Beatles ones ended behind the strut anyway, like this one, so the cut-outs would have been redundant. 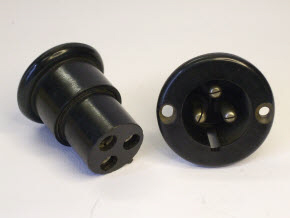 Note too the Bulgin power socket, sometimes used by Triumph. 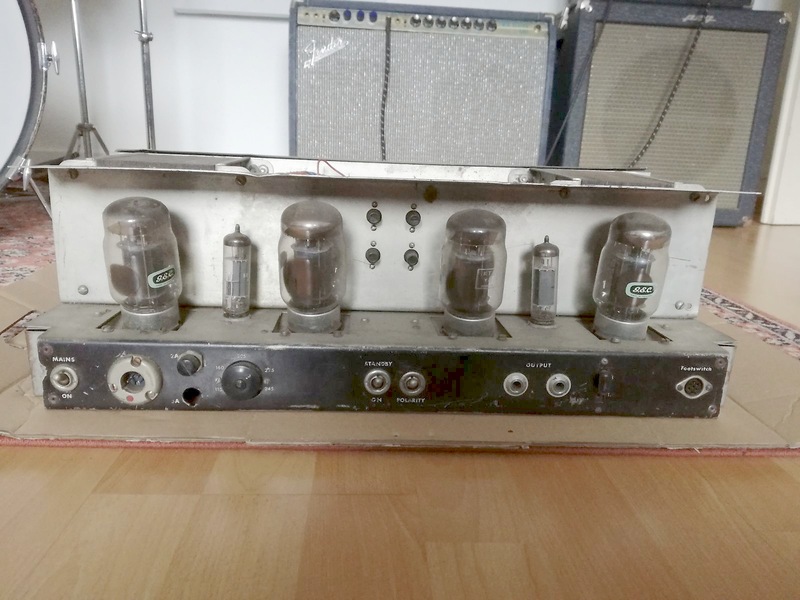 It’s hard to discuss the possibility of something you can’t see though, so even though the front of this Swiss amp looks to be from the same template and maybe production run as the ones used on the actual Beatles amps, it was difficult to go much beyond that. 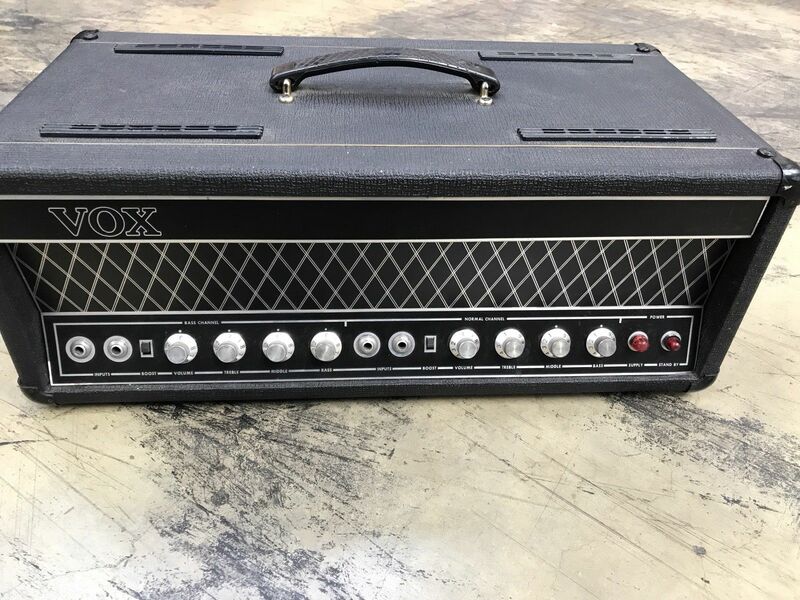 The front had the same characteristics we’ve discussed in other amps with proto fronts; different font for the labels or ‘legends’ making it look faint in photos, different placement of legends, smaller VOX logo, different design of diamonds. 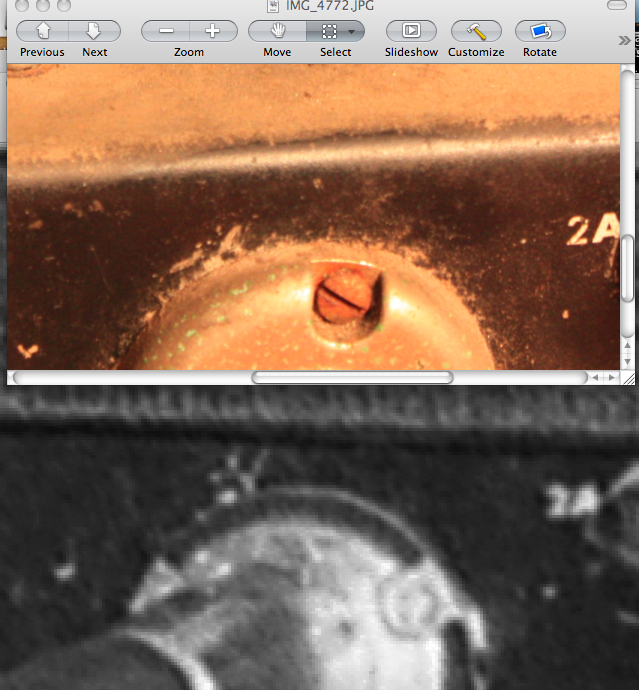 It looks to have the same panel then, and the same slanting valve design, which is itself pretty remarkable. Without an x-ray of the Beatles amps though or a photo of the insides, it seemed that it would be hard to go much further than that. Or at least, that’s what we thought, at first.